7% is the words we use. It can be helpful to use orienting names whenever you can, such as “Your son Jack”. You may need to use hand gestures and facial expressions to make yourself understood. Pointing or demonstrating can help. Touching and holding their hand may help keep their attention and show that you care. A warm smile and shared laughter can often communicate more than words can. Don’t talk about people in front of them as if they are not there. Adapted from Understanding difficult behaviours, by Anne Robinsons, Beth Spencer and Laurie White. Christine Bryden (Boden) was diagnosed with dementia at age 46, and has shared a number of her insights about ways that families and friends can help a person with dementia. Christine is also the author of a number of publications, including Who will I be when I die?, the first book written by an Australian with dementia. Be patient - Give us time to speak, wait for us to search around that untidy heap on the floor of the brain for the word we want to use. Try not to finish our sentences. Just listen, and don’t let us feel embarrassed if we lose the thread of what we say. Don’t rush us into something because we can’t think or speak fast enough to let you know whether we agree. Try to give us time to respond – to let you know whether we really want to do it. Background noise is confusing - Avoid background noise if you can. If the TV is on, mute it first. Wear ear plugs - Consider purchasing and getting a person with dementia to wear ear plugs for visits to shopping centres and other noisy places. 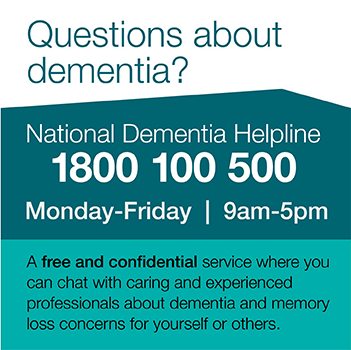 More information about dementia is available under Help Sheets & Update Sheets section of our website or to find out more, call the National Dementia Helpline on 1800 100 500.